Q: We bought a 5-year-old gelding that has laminitis. A vet suggested we block the nerves in his worst hoof. What are the pros and cons of doing this, and are there any other options? We only do light pleasure riding. A: To start, I am wondering if there is some confusion as to what lameness syndrome your horse is experiencing. 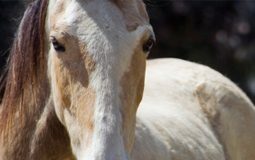 A horse with laminitis should never be nerve-blocked; this is a diagnostic procedure that temporarily numbs specific regional nerves for 30 to 60 minutes. 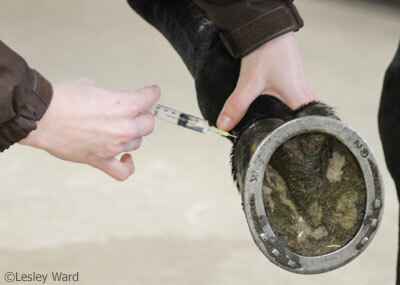 An anesthetic is injected into nerve branches near the lower pastern in order to locate the source of lameness/pain. Numbing the nerves that feed the foot would cause him to override his natural, protective response of keeping excess weight off the damaged hoof. By not feeling as much pain and discomfort, he is then likely to worsen damage to the hoof capsule. Increased stretching of the laminae could exacerbate coffin bone rotation and internal damage to the lamellar structures of the hoof wall. Laminitis must be treated by a vet and resolved before your horse can be ridden again. On the other hand, a discussion on how to manage a horse with navicular syndrome could include the option of “nerving”: cutting the lowest area of the nerves on the back of the pastern with a scalpel to eliminate transmission of pain signals from the rear third of the hoof to the brain. This procedure is sometimes used as a final effort to salvage the comfort of a horse that hasn’t responded to medical treatment for navicular disease. Nerving works well for some, but for others it only provides relief for several months to a few years, as the nerves often regrow. However, there are many other options you can try before going to the surgical extreme. Excellent results can be had by modifying your horse’s shoeing approach and frequency. It is also a common practice to inject the coffin joint with anti-inflammatory medications, as there is some interconnectivity between the navicular bursa and the coffin joint. Lameness originating in the navicular structures may also cause pain within the coffin joint. When this is effective, it’s often necessary to do these joint injections twice a year. In some cases, injecting the navicular bursa directly is the best way to go, but this should be done in a facility that has the proper imaging to guide the injection. Other treatments for navicular disease include the use of systemic joint supplements, such as intramuscular Adequan or intravenous Legend, as these are known to target soft tissues (tendons and ligaments) and joints. In addition, treatment attempts with isoxsuprine or Tildren have yielded some good results. Have your vet show you exactly what part of your horse’s anatomy may be involved through medical illustrations, and ask for a thorough explanation of possible medical treatments before resorting to surgical nerving.